Accuride is the largest company in the world dedicated to precision ball bearing slides, Accuride sets the standard for smoothness, silence, and strength. Accuride slides are found in applications such as office furniture, medical equipment, ATMs, cash drawers, copy machines, toolboxes, appliances, electronic racks, and more. Design innovation is at the core of our business, and our extensive product selection ensures just the slide you need for your application, large or small. To the Design Engineer: This document is designed to assist you in making the proper slide selection for your application. The information listed provides an overview of the slides available and some pertinent information to consider when selecting a slide. Should you need any additional information, data sheets and specific design information are available for all products. 1. Maximum permissible load for a pair of side mounted slides. 2. Center of gravity of load centered between and at the midpoint of the drawer members. 3. Based on 10,000 cycle dynamic tests. 4. Includes 100% static safety factor. 5. Load ratings are based on side mounting the slides. 6. Undermount of the slides is not recommended and reduces load carrying capacity to about 1/4 of the side mount capacity. The amount of room necessary between the drawer side and the cabinet or the chassis and the rack. The side space dimension is critical for optimal smooth movement. Special brackets are available to reduce the side space required in an electronics rack with model 305A-LR. These brackets allow a portion of the slide to be mounted behind the vertical rail. 3/4 Extension ~ Drawer opens partially, approximately 3/4 of the total slide length. Full Extension ~ Drawer opens the same amount as the slide length. Over Travel ~ Drawer opens further than the length of the slide. This allows the drawer to pull completely out of the cabinet providing access to the entire drawer. Allows the drawer or chassis to be removed from the case or rack. A lever or latch must be actuated before the drawer can be removed from the cabinet. Holds the slide open or closed until extra force is applied to overcome the detent. Secures the slide in position. A lever or latch must be actuated to move the slide. 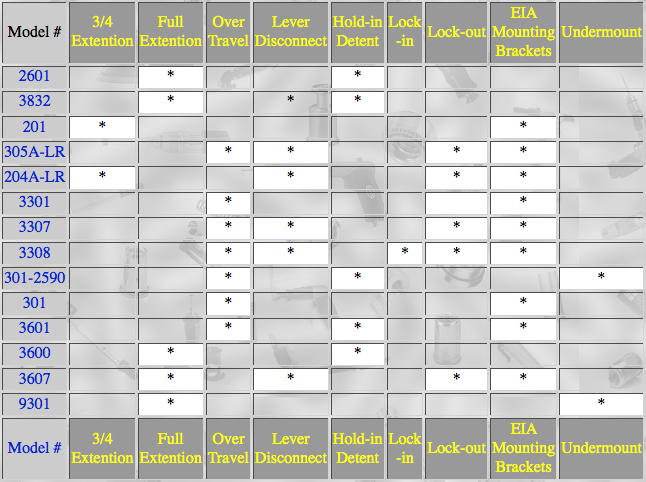 A lock-out feature assists servicing components without removing the unit from the enclosure. A lock-in feature prevents drawers from opening until a latch is actuated. Optional brackets are available to make it easier to mount slides in an electronics rack or enclosure. Please refer to rack mounting accessories. Refer to individual product data sheets for recommended screw sizes. Slides and mounting hardware packed separately, one part number per box. Package containing one pair of slides, mounting hardware and installation instructions sealed in a polybag. To order, add a "D" to the end of the part number. Avaliable in even lengths 8"-22"
Avaliable in even lengths 10"-28"
Avaliable in enen lengths 12"-28"
Avaliable in even lengths 12"-28"
1" Over Travel, .50" Slide space, Avaliable in even lengths 12"-28"
Hold-in detent, Avaliable in even lengths 12"-28"
Lock out, Avaliable in enen Lengths 12"-28"
Avaliable in even lengths 12"-36, 48", 60"
Prevents snagging and tangling of cable when chassis is moved.